Woodworms are household pests you can possibly find in any part of the house, your treasured wooden chairs, dining tables, and oak beams are no exception if conditions exist for infestation. But how do you spot them and how to resolve the problem? Dealing with woodworm issue can be quite a challenging task. But worry no more because woodworm infestation is treatable and preventable. A lot of people know only a few things about woodworm so often they mistook it for something else. Woodworms are wood-boring larvae of beetles. Most of the time, you’ll never actually see them as they stay hidden munching on wood. Adult beetles lay their eggs on or under the surface of a wooden item. When the eggs hatch into worms, they bury themselves deeper into the wood to feed. The repeated nesting and feeding on wooden pieces weakens the material, eventually destroying it. You can find them in all manners of wood surfaces including furniture, roof timbers, wooden tools, or musical instruments. Since there are many types of woodworm, there is no hard and fast rule about which type of wood they’ll likely to feed. While others prefer hardwoods such as oak wood, elm, and mahogany, all wood-boring beetles love to thrive in damp conditions. Fireplaces are designed with a classic oak beam which can be a potential thriving site for woodworms too. Wooden ornaments such as those in your decorative doors are also usual spots to find a woodworm. How to Identify Woodworm Infestation? Dealing with the problem can be fast and relatively easy if you spot it early enough. Thus, it is wise that you should be able to identify telltale signs of a potential active woodworm infestation. Some of which are flight holes in timber, crumbling wood around the corners or edges of roof joists or floorboards, and the presence of alive or dead adult beetles around your furniture. Finding numerous small holes on the wood is the most indicative sign of a woodworm infestation. Most people might take this as a good sign that the woodworm has left. But that is not always the case as it is very likely that the original woodworm has left its offspring behind in the wood. To find out if woodworm is active, look out for any droppings or frass, which looks like fine sawdust usually visible below the infested timber. When it comes to getting rid of woodworm, you can either do it on your own or hire an expert. If your woodworm infestation only affects small items such as furniture, you can effectively treat it by yourself using the correct techniques and treatments. You can cover holes by brushing them over with a coat of emulsion or sticking masking tape to prevent adult beetles from nesting. Flytraps to catch and contain adult wood boring beetles can also be useful. Before treating any woodworm infestation, it is crucial that you know the type of woodworm you are dealing. If you are unsure, it is wise to consult first an expert. For severe infestations with extensive damage, it is best to contact professional help to get rid of the problem for you. How to Prevent Woodworm Infestation? Prevention is always the key. If you have encountered woodworm infestation before, then you should probably know that woodworm prefers to thrive in humid areas. To prevent another pest outbreak, keep your home well heated and ventilated. Make sure to remove all woodworm infected items from your home. 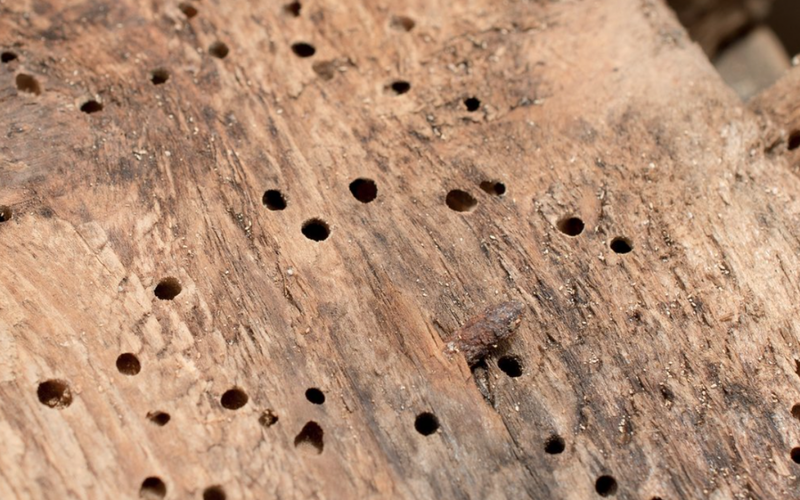 Once woodworm turns into adult beetles, they can travel around and lay eggs on to other wood pieces in your home – and we don’t want that to happen. Prevent this problem by keeping infested pieces of wood out form your home as soon as possible. Before you purchase timber for your garden or fireplace, check if it is of good quality making sure that it is free of any infestation. When installing a fireplace in your home, it is best if you get a consultation for professional assistance. While you can deal with woodworm on your own, in most cases you should always get the job carried out by a professional for an efficient result. Also, the eradication of pests involves the use of chemicals that might be a threat to your health.